On Wednesday, several of our SJS students competed in the NWNJ Scholastic Team Chess Tournament at Sussex County Community College in Newton. 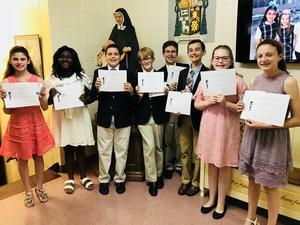 On Wednesday, St. Joseph School inducted eight new members to its National Junior Honor Society. Students were chosen for the NJHS based on their academic performance as well as their accomplishments in the areas of Leadership, Service, Citizenship and Character. Congratulations to our newest inductees. Our St. Joseph School annual Spring Musical was amazing! What a wonderful job our middle school students did! Check out the "Newsies" Featured Video below! SJS First Grader Graham Murphy did an outstanding job as St. Joseph School Principal on Friday, May 10. The April SJS Community Helpers Story Hour Featured Our Own Jim Cillo! Chief Cillo shared his fun childhood experiences with our students and inspired them to use their imagination! Click here to view our Featured Video of SJS students singing The Divine Mercy Chaplet. SJS dismissed for Easter and Spring Break but not before our annual Holy Thursday activities including the Seder Supper and Stations of the Cross. Hat's Off to Another Exciting Easter Hat Parade! Our Easter Hat Parade has become a favorite tradition at SJS!